It's important to keep our girls on the agenda. Lacking huge resources and robust participation by people who are still sitting on the fence on this issue, I believe it's important to stand up and be counted. The US-Africa Summit brought most of Africa's heads of state to the US to discuss US-Africa trade. The Young African Leaders Initiative was also combined with the events for the trade talks. I have no doubt that the trade will benefit the US and will have underwhelming impact on Africa. It is also most unfortunate that the neoliberal model of trade is being pursued. This means that in the US, the trade will benefit the large corporations like Bloomberg, Monsanto, Dow, General Electric and the like, to the detriment of small and medium scale enterprises. It is also curious that African American businesses are not privileged in these deliberations. Neither are businesses owned by new African immigrants to the US, who could be a bridge between American businesses and African customers. It is mighty curious that African heads of state are figuratively selling their heritage for the proverbial and Biblical "mess of pottage". What is in this trade arrangement for Africa? How is it better than what obtains before? What does it mean to be a sovereign state? Why should you all be called here to the US like a headmaster calling school children? Why do the first ladies participate in a public forum where they are lectured at by people whom even I could "school"? Is there any recognition that there are African immigrants right here in the US who are experts on all the issues being discussed? To what extent were they meaningfully and comprehensively consulted by either the Obama administration, the First Lady of the US, or the African governments of the countries from which they originate? My observations on the Obama administration and its dismissive attitude toward Africa is found in the following article by the Voice of America: "African Experts Expected More from Obama Administration"
I went primarily to protest. 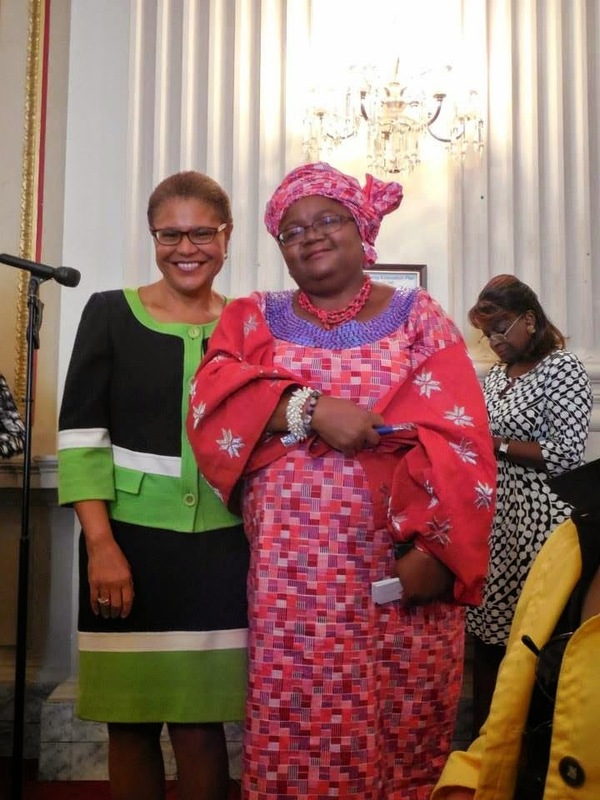 I also attended the AGOA conference organized by Congress Member Karen Bass, the Ranking Member, Foreign Affairs Subcommittee on Africa, Global Health & Human Rights. Below are pictures from Hon. Karen Bass' site. I was waiting to ask a question. Just so happened it was the first question. The context: I was at the AGOA conference referenced below. Thank you for signing up to participate in this forum during the historic U.S.-Africa Summit. I look forward to seeing you next week. During the Q.& A, After the first panel, I was able to ask the panelists on "Africa's regional economic priorities", each of whom spoke about the linkage b/w peace and security plus economic development and good governance plus democracy the questions: If peace and security are as important as you have assured us, why did it take the President of France to convene a meeting of the Presidents of West African countries to discuss joint approaches and strategies to combat the Boko Haram threat? Why also have our Chibok girls not been rescued? What are you doing to respond to the massive humanitarian crisis that is unfolding? How can African governments guarantee the peace and security of all their people no matter how remote their location? After that first panel was concluded, I began lobbying the Members of Congress at the meeting. I began by having a brief one on one conversation about our girls with Leader Nancy Pelosi. One of her aides already followed up. After the Congressional recess, #BringBackOurGirlsNYC intends to work on this matter until our girls are released, reunited with their families, and given the psychosocial support they need to resume their lives with a semblance of normalcy. And my Sister Friend, Prof. Olivia Cousins, (who took all the pictures at the AGOA Conference, as well as at the protest on August 6, and was a tremendous support all through the process of planning, navigating the DC transit system, and generally getting things done), is here below with me and Leader Pelosi. I also spoke with Congress Member Karen Bass, and will follow up with her on the matter of our girls. So will #BringBackOurGirlsNYC. I spoke as well with Congress Member Sheila Jackson-Lee (who apparently presented President Goodluck Jonathan an award at the Nigerian Heritage on Monday night). She promised to look into our concerns. I told Congressman Gregory Meeks, who said Diasporan Africans are Africans without concern for geographical divisions, that he is now my adopted Brother. I will follow up with him on the matter of our girls. So will #BringBackOurGirlsNYC. Back to the AGOA conference, I guess since I was on the listserv, I was invited to a Congressional hearing on Ebola on Thursday, August 7, by a staffer of Congresswoman Bass, but the event was over-subscribed. I got there on time but there were already so many people on the line for the overflow room that I realized I should have been there about 2 hours ahead of time.